An infusion of (water, green tea, lemon verbena, spearmint leaves, lemongrass, natural flavour), absorbic acid. 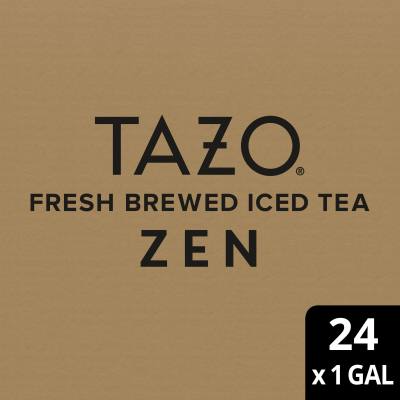 With harmonious flavor and aroma, Tazo Fresh Brewed Zen Green Iced Tea is an exquisite beverage that invites your guests to sip, contemplate, and engage. Infused with crisp lemongrass and spearmint, this refreshing green tea awakens the senses. Tazo Fresh Brewed Zen Green Iced Tea is perfect for mixing and experimenting and allows you to serve iced tea lemonade, iced green tea lattes, tea cocktails, spritzers, and other green tea-inspired creations. Ideal for restaurants, cafes, and hotels, this iced beverage is perfect for guests and employees who desire an enlightened sipping experience. Empty contents of one pacakge into filter of clean brew basket. Slide brew basket into brewer. Press brew button when ready light appears. Store iced tea at room temperature. Do not refrigerate. Dispose of any unused tea at the end of each service day. Clean and sanitize brewer, dispenser and faucet daily.